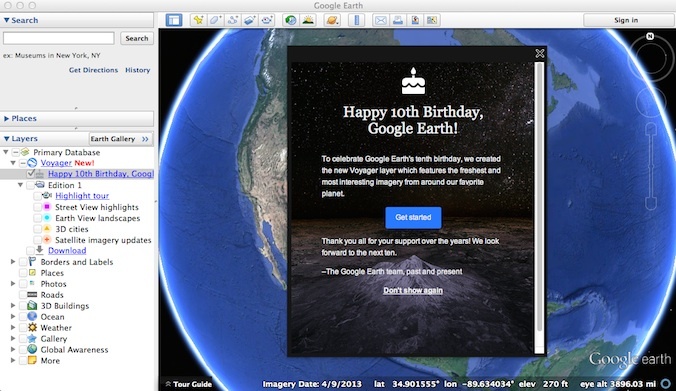 Google blogged today about Google Earth turning 10 and announced some new content in celebration. This announcement brings out some revelations about the future of Google Earth as well. So, we are very excited by the announcement here at Google Earth Blog. The layer also has a “Highlight tour” that literally flies you around the Earth to highlight samples from each of the new layers. Just to give you a taste, I’ve created short YouTube video that demonstrates the new layer and the tour. Today’s Google blog post was by Sean Askay who has been written about many times on Google Earth Blog. In the early days after Google Earth was released, Sean used the program for his Master’s studies. He later created some amazing stories using Google Earth and he was so innovative that Google ended up hiring him. He went on to create even more content, but also created the Tour mode in Google Earth that is actually a great resource for doing self-guided demonstrations (including the new Voyager layer). My favorite was the one he did with Astronaut Buzz Aldrin for the 30th anniversary of the Apollo 11 landing on the moon in 2009. In Sean’s post, he not only announced the new Google Earth Voyager layer, but also a larger collection of beautiful Earth Views for the popular Chrome extension, and a slick new Earth View web application that shows not only the views, but also a little animated globe mapping the location of each shot. Google made it very plain in their blog post, and in the new layer, that they look forward to seeing Google Earth for another ten years. Considering our fears of the possible demise of our favorite app, for the last couple of years, this is really good news. But, it gets even better. According to a recent interview on Wired, Sean is now the lead engineer overseeing future work on Google Earth. That’s particularly good news since two of the most important guys that built the original Google Earth have recently left Google (Michael Jones is now CEO of Wearality, and Brian McClendon is now going to Uber). In the Wired interview, Sean, and Google Earth Outreach manager Rebecca Moore, made some interesting comments about future plans for Google Earth which indicate a lot of thinking about leveraging the vast array of data Google has developed to create even more dynamic databases for new versions of Google Earth. And hints at uses of VR and AI technologies. So, for the millions of fans of Google Earth out there, this really is a good cause for celebration. The future looks much brighter for Google Earth. Thank you Google for maintaining your commitment behind one of your greatest products! The hints about the future of Google Earth are welcome news, as is the upturn of activity from Google. However, ‘new highlights and tours’ might be more appropriate than “new content” as a description of this anniversary offering as there is little or no new material in the sub layers. The new imagery layer while welcome in principle appears to lack any date(s) or any time slider option so is likely to be of limited interest to GEB readers who miss the imagery update KMLs. PS Satellite imagery update layer (to give the ‘correct’ name) – discovered by chance that a click within any patch of new imagery gives a pop up with the date of acquisition [by Google]. No indication as yet of how often this layer will itself be updated, and whether on a rolling basis of periodically. Great Sean. Now please convince the Google Maps folks to bring back export a custom map to a KML file. These were great to bring into Google Earth and tour your route, etc. I think Google Maps just didn’t like folks using their mapping software to bring custom routes into other programs. Sean, give it a try. Thanks! Great news. Hope they recreate the monthly imagery update outlines in subfolders. I miss the KMLs. Happy Birthday Google Earth. Right after introduction of Voyager layer, the 3Dconnection Space navigator does not work anymore in Google Earth/Pro for Mac (all settings are intact and in all other apps the hardware works well). Radek, I had no problem with my SpaceNavigator on a Mac after the update. Normally a new layer like this should have no effect on the interface with a hardware device like the SpaceNavigator. There is likely some other cause for your recent issue. Can you give more detail? Are you having the same problems with a Space navigator? Also here. Space navigator stopped to work with Google Earth after Voyager layer. The rest of compatible 3DConnexion apps continue to work normally. Tried to change Preferences –> Navigation Non mouse controller –> Enable controller with no success at all. Now I’m running GE 6.2 and Spacenavigator works again. 🙂 (Do not forget tho check “Non mouse controller” in GE preferences. I’ve submitted a bug report to Google and they have confirmed there is a problem. It does not have to do with the Voyager layer, it is the latest release of GE. Hopefully it will get addressed whenever Google updates to the next release of GE for desktop. They recommend copying files from the 3Dconnexion library to Google Earth’s library. Nice and all, but how do I get rid of the “Happy Birthday” splash screen that shows up about every 4th time I start up Google Earth? Clicking on “don’t show again” doesn’t stick. Deselect it in the layers and make sure Google Earth exits properly and it should stick. I want this layer closed on startup. Why is this layer always opened? Why does Brazil has several high resolution 3D cities (basically, all 12 World Cup Host Cities + a few other state capitals, like Goiania and Florianópolis) and yet, those 3D cities are NOT listed under Voyager? ps, Buenos Aires and Santiago are also high-res 3D cities (and possibly some other S.American cities). The voyager layer highlights only some recent additions. As I mention in the post, try our KML file instead for full coverage.